Our usual security audit for Fedora Core 6 is now available. For 20020101 to 20061023 there are a potential 1758 CVE named vulnerabilities that could have affected FC6 packages. 93% of those are fixed because FC6 includes an upstream version that includes a fix, 1% are still outstanding, and 6% are fixed with a backported patch. Most of those outstanding issues are for low or moderate severity flaws that are not fixed upstream. There's a new Apache HTTP Server security issue out today, an off-by-one bug that affects the Rewrite module, mod_rewrite. We've not had many serious Apache bugs in some time, in fact the last one of note was four years ago, the Chunked Encoding Vulnerability. This issue is technically interesting as the off-by-one only lets you write one pointer to the space immediately after a stack buffer. So the ability to exploit this issue is totally dependent on the stack layout for a particular compiled version of mod_rewrite. If the compiler used has added padding to the stack immediately after the buffer being overwritten, this issue can not be exploited, and Apache httpd will continue operating normally. Many older (up to a year or so ago) versions of gcc pad stack buffers on most architectures. The Red Hat Security Response Team analysed Red Hat Enterprise Linux 3 and Red Hat Enterprise Linux 4 binaries for all architectures as shipped by Red Hat and determined that these versions cannot be exploited. We therefore do not plan on providing updates for this issue. In contrast, our Fedora Core 4 and 5 builds are vulnerable as the compiler version used adds no stack padding. For these builds, the pointer being overwritten overwrites a saved register and, unfortunately, one that has possible security consequences. It's still quite unlikely we'll see a worm appear for this issue that affects Fedora though: for one thing, the vulnerability can only be exploited when mod_rewrite is enabled and a specific style of RewriteRule is used. So it's likely to be different on every vulnerable site (unless someone has some third party product that relies on some vulnerable rewrite rules). Even then, you still need to be able to defeat the Fedora Core randomization to be able to reliably do anything interesting with this flaw. So, as you can probably tell, I spent a few days this week analysing assembler dumps of our Apache binaries on some architectures. It was more fun than expected; mostly because I used to code full-time in assembler, although that was over 15 years ago. Here is the patch against 2.0, the patch against 1.3 or 2.2 is almost identical. 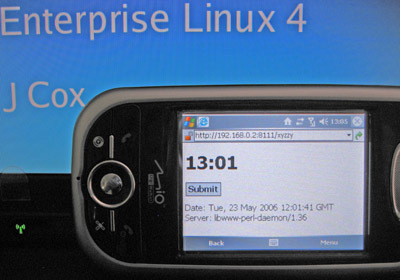 On Friday 14th July an exploit was widely posted for a vulnerability in the Linux 2.6 kernel, CVE-2006-3626, which attempts to allow a local user to gain root privileges. The exploit relies on the kernel supporting the a.out binary format. This vulnerability does not affect Red Hat Enterprise Linux 2.1 or 3 as they are based on 2.4 kernels. Red Hat Enterprise Linux 4, Fedora Core 4, and Fedora Core 5 do not support the a.out binary format, causing the exploit to fail. We are not currently aware of any way to exploit this vulnerability if a.out binary format is not enabled. In addition, a default installation of these OS enables SELinux in enforcing mode. SELinux also completely blocks attempts to exploit this issue. The Red Hat Security response team have therefore rated this as having moderate security severity for Enterprise Linux 4. No asynchronous kernel update for this issue is currently planned; the fix for the flaw will be included in some later scheduled update. Earlier this month Red Hat started publishing Open Vulnerability and Assessment Language (OVAL) definitions for Red Hat Enterprise Linux security issues and today we obtained official compatibility. But what are these definitions, how do you use them, and why are they important? One of the goals of Red Hat Enterprise Linux is to maintain backward compatibility of the packages we ship where possible. This goal means making sure that when we release security updates to fix vulnerabilities that we include just the security fixes in isolation, a process known as backporting. Backporting security fixes has the advantage that it makes installing updates safer and easier for customers, but has the disadvantage that it can cause confusion to people unfamiliar with the process who try to use the version number of a particular piece of software to determine it's patch status. In 2002, Red Hat started publishing Common Vulnerability and Exposures (CVE) vulnerability identifiers on every security advisory in order to make it easy to see what we fixed and how. Customers need only know the CVE identifiers for the vulnerabilities they are interested in and can then find out quickly and easily which of our updates addressed that particular vulnerability. CVE is now used on security advisories from nearly all the major vendors. Red Hat has a single common mechanism for keeping systems up to date with security errata, the Red Hat Network. The Red Hat Network looks at a customers machines to determine which updates are required and gives anything from a customised notification that an update is available through to automated installation. Third party patch auditing tools don't have such an easy time figuring out what up dates are required: they have to maintain their own list of Red Hat package versions against vulnerability names. As this list is different for each operating system version from each potential vendors, these tools are prone to many errors and lag behind our updates. We've also found customers that query the Red Hat Network errata pages directly to gather information about our security advisories and put them into a format they can integrate with their own processes. Many customers take feeds of vulnerability data, usually in some XML format, from third party security vulnerability companies. MITRE recognised both of these issues a number of years ago when they founded the Open Vulnerability and Assessment Language project, OVAL in 2002. The aim of OVAL is to provide a language for defining how to test for vulnerabilities and system configuration errors in an open and cross-platform manner. Red Hat was a founding board member of the OVAL project as part of our overall commitment to security quality. So Red Hat now publishes OVAL 5 definitions for our Red Hat Enterprise Linux 3 and 4 security advisories. Each security advisory gets a separate XML OVAL file which defines the steps needed to test if an update is required for the target system. In an ideal world every Red Hat Enterprise Linux system would be consuming every update from Red Hat Network automatically, but for those that don't or where systems have been disconnected for some time, these definitions can help determine the patch status. In addition, these definitions contain selected info rmation from our advisories which can be combined with vulnerability feeds from third parties. The actual OVAL definitions themselves are available from https://www.redhat.com/oval/ and are public within a couple of hours of an advisory being pushed to the Red Hat Network. OVAL definitions for all previous Red Hat Enterprise Linux 3 and 4 advisories are also available. At present we do not ship OVAL tools such as a definition interpreter, but there are severalopen-source and commercial OVAL-compatible tools available. For the future we encourage other vendors to publish definitive OVAL definitions for their products too, and we hope to work on compatibility testing with other operating system and tool vendors. More information about the make-up of the OVAL patch definitions can be found at the MITRE OVAL site. An FAQ about our implementation and where to contact us with comments or questions is also available. First was the debacle which was a 7 hour delay getting to Nashville after a flight was cancelled. Now, at 9pm the day before my 6am flight from Nashville to London tommorrow they cancel my flight and are unable to get me to London in time for my Monday meeting. So I miss my meeting and total for the week I'll have had 18 hours of delays. Although perhaps I shouldn't blog this until I'm home as I'm still in Nashville and, nice that it is, don't want to spend another year here. So thats four out of my last six AA trips that have gone significantly wrong, and I only used AA this time because I wanted to upgrade and had miles left. However, rant aside, this trip was all about the Red Hat Summit. I was pleasantly suprised by how smoothly it ran and how useful it was to have face-to-face meetings with some of the people I interact with daily by computer. There's a few cool things that the trip acted as a catalyst for, but you'll need to wait to find out ;) I tried to speak to many different attendees over breaks in the days, and consensus was positive with all the first-timers wishing to attend again in the future. Just back from my two presentations and I've uploaded the final versions (which replace the ones distributed on the conference CD). When I give presentations I have to find something to display the time (since I never wear a watch), somewhere to put some speaker notes down (since I sometimes forget a useful point), and then I keep knocking it all over everytime I go to the laptop to hit space to get the next slide. I'd quite like to use the laptop display to display my speaker notes and a clock, but OpenOffice doesn't support doing that yet. I recently changed to using a smartphone to save carrying around and having to recharge lots of gadgets. I bought a Mio A701 which is a nice phone, PDA, and has GPS in one package. Since the Mio also has bluetooth I thought that for my presentations at the Red Hat Summit next week it would be nice to use the PDA to control the presentation, watch my time, and give me any speaker notes. The smartphone runs Windows Mobile 5, unfortunately and I wanted to set something up quickly and without much effort. I don't mind writing apps for it, but I'd rather avoid it. So my first thought was to use vnc, but the vnc client on the pocketpc wasn't great and kept crashing, and I'd have to create some app to interface with OpenOffice anyway. Once OpenOffice supports multiple displays it may be more useful to revisit doing this via vnc. My laptop runs Fedora Core 5 with a MSI bluetooth USB dongle plugged in. This should have been the easiest step, but took an hour to get working right as I originally struggled getting the phone to connect to a 'serial port' service. The commands below were sufficient to advertise a 'dial up network' service and have pppd handle the connection. I didn't bother setting up any IP forwarding as I don't need the phone to be able to use the laptop as a way to get generic network access. Then on the Windows Mobile I added a new connection, selected "bluetooth" modem, created a new partnership with the laptop DUN service, any phone number, any username and password (to stop it prompting later), advanced to remove the "wait for dial tone" option. If you're doing this from scratch you'll need to play with settings in /etc/bluetooth/hcid.conf to make sure you set up a PIN for pairing and so on. Once this is done using the browser on the phone with a URL of https://192.168.1.1/ causes it to connect, pppd starts, and the phone happily can connect to the web server on the laptop. If you want DNS working you'll need to mess with the dns IP above or make sure your laptop DNS server is set up to accept connections on that interface. So far so good. The next step was to be able to control the presentation. I couldn't see any nice way to remotely control OpenOffice.org, so a colleague suggested finding something that used the xtest extension just to inject keystrokes. the X11::GUITest perl module on CPAN does the job perfectly. So I hacked up a quick perl script you run as your local user that acts as a web server and on certain requests will inject a space character into whatever has focus. Next step is to get the mini perl webserver to display my speaker notes as well as the link to the next slide, although, to be honest, I could probably have committed the notes to memory in the time it took to set this all up. 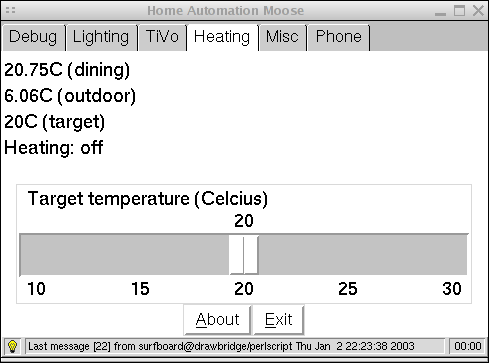 The biggest problem with my home-grown Home Automation system was that I'm not a graphic designer. My displays all looked a little clunky, like they'd come out of the 1980s. Guests only ever see the user interface displayed on the tablets around the house, so I took some time over the Easter holiday to make the user interface look a bit nicer. The user interface is written in Perl/Tk and was designed to be snappy even on the original Point 510 (100Mhz) tablets. I'd already replaced these tablets around the house with Point 1600 tablets (most picked up on ebay for about 50-100 pounds each) with the main advantage that the Point 1600 can run at 800x600 in full-colour rather than the 256 colours of the 510 in the same resolution. I first looked around the web to see if there were any existing Perl/Tk projects that had exciting graphic design I could base on, but I didn't find anything very useful. In the end I decided to make the UI look like a web site design proposed by a colleague at Red Hat for some internal site that didn't get used. 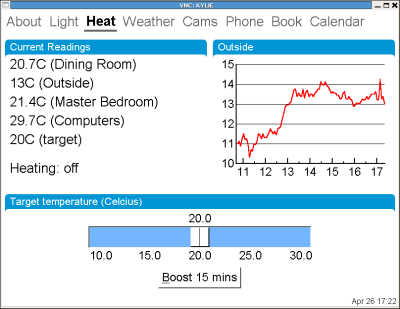 The Heating interface lets you look at graphs of past readings for any sensor or change the target temperature of the house. Actually we only have a couple of X10 lights in the house, and we really only ever control the living room lights. This is just screen-scraped from the BBC website and updated every hour. 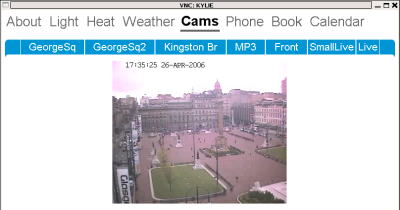 We use this screen to look at the security cameras as well as some other Glasgow web cameras. The interface allows multipart-jpeg streaming (compatible with ZoneMinder). 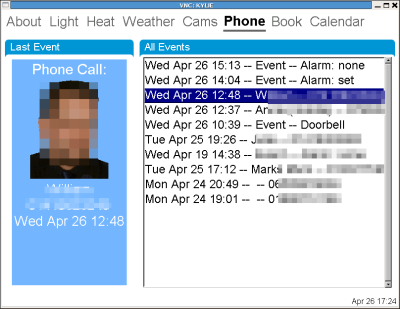 This actually displays a number of events such as the status of the house alarm, capturing when the doorbell is pressed, as well as popping up details of who calls us. Old heating interface for comparison. See my original software page to see how the other screens looked. The rest of it was just messing around with frames and alignment and creating the curved edges. I used the gimp to get a curve I was happy with, then coverted it from a GIF to xpm with reduced colours. The xpm was then coded into the application and simplified so that the program can generate the right curves for any font size. Remember all those reports which compared the number of security vulnerabilities in Microsoft products against Red Hat? Well researchers have just uncovered proof and an admission that Microsoft silently fix security issues; in one case an advisories states it fixes a single vulnerablity but it actually fixes seven. Whilst you could perhaps argue that users don't really care if an advisory fixes one critical issue or ten (the fact it contains "at least one" is enough to force them to upgrade), all this time the Microsoft PR engine has been churning out disingenuous articles and doing demonstrations based on vulnerability count comparisons. My home automation tablets use Perl/Tk as their user interface which makes coding and prototyping really quick and easy and works on both Linux and Windows platforms. I use ZoneMinder for looking after the security cameras around the house and had set up the tablets to be able to display a static image from any camera on demand. But what I really wanted to do was to let the tablets display a streaming image from the cameras. ZoneMinder is able to stream to browsers by making use of the Netscape server push functionality. In response to a HTTP request, ZoneMinder will send out a multipart replace header, then the current captured frame as a jpeg image, followed by a boundary string, followed by the next frame, and so on until you close the connection. It's perhaps not as efficient as streaming via mpeg or some other streaming format, but it's simple and lets you stream images to browsers without requiring plugins. So I wrote the quick Perl/Tk program below to test streaming from ZoneMinder. It does make some horrible assumptions about the format of the response, so if you want to use this with anything other than ZoneMinder you'll need to edit it a bit. It also assumes that your network is quite good between the client and ZoneMinder; the GUI will become unresponsive if the network read blocks. My first attempt ran out of memory after an hour -- I traced the memory leak to Tk::Photo and it seems that you have to use the undocumented 'delete' method on a Tk::Photo object otherwise you get a large memory leak. The final version below seems to work okay though. $lastimage->delete if ($lastimage); #essential as Photo leaks!